A few days before we left Alabama for Mexico, our friends threw us a great outdoor dessert party. Yes, just desserts. And yes, I sampled them all. Surprisingly, it happened to fall on the coldest day of the fall summer. I think it was in the 60's. In Alabama. In August. That be Cray. I love being able to look back on these photos and see our friends who we already miss so much. Some of these people Wade has known since childhood. These guys have been by Wade's side for 20 years and we could not be more thankful for them. They're not just friends, co-workers, fellow church members -- they're family -- and we miss them terribly! Luckily for us, many of them come to this same village in Mexico once or twice a year with the mission team. In fact, several of them will be here for Thanksgiving! I'm already counting down the days. Thank you to everyone who came!! You sent us off feeling loved and encouraged. This beautiful piece of scripture will most definitely be going on the walls of our home in Mexico when we get it set up. Madison made it for me, as well as a book of letters that she wrote to Wade and I where she said she was sad to see us go, and would miss us so much, but that she knew God would use us to share the love of Jesus with others. This girl gets it y'all. I can't wait for her to come back down to Mexico next summer! I have been so blessed by the kids who have come on our trips to Mexico in the past. Two Sunday's before we left, I got the privilege of assisting them as they sat in front of the entire children's church to share about their experiences in Mexico. Many of them have expressed encouragement and love to us in our move. This little girl even prayed on the night that we left that the Lord would help her not miss me and that she would learn to share me so that I can share Jesus with others. Man do I love our Mexico Mission kids! What I would have given to go on a mission trip at such a young age! 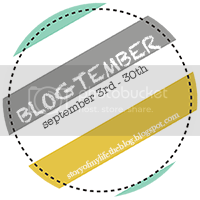 This month, I'm participating in Blogtember, which I hope will help me to stay committed to blogging as I continue to transition into our new life in Mexico. Hopefully the prompts will help me along. Sometimes I'm sure I'll end up blogging about something else, or missing a day all together. But the main point is to keep writing, keep sharing, and keep connecting! Today's prompt was to describe where we are from: the people, places, and factors that make up who we are. These people are just that.